Ericameria linearifolia grow through much of California's hot interior through the Chapparal, Creosote and Joshua Tree habitats. 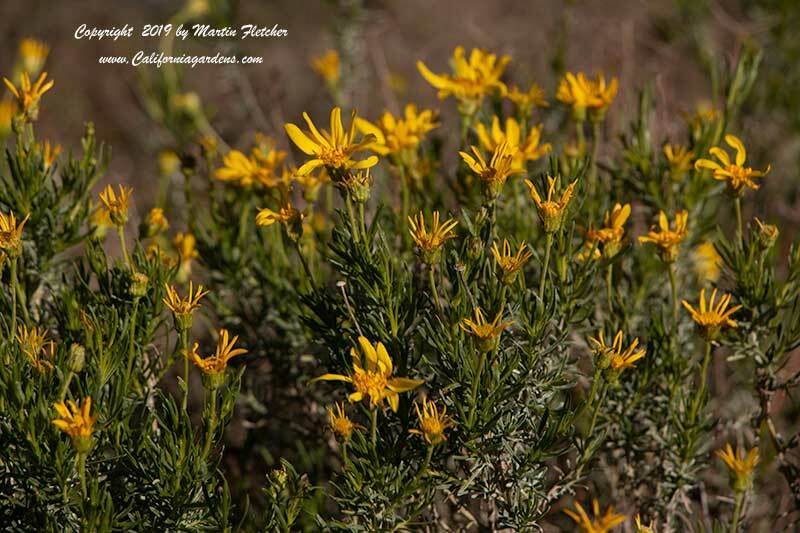 Narrowleaf Goldenbush has a long blooming period from Winter through Spring. Ericameria linearifolia grows 2-4 feet tall. The green foliage is topped by golden yellow flowers when moisture is available Summer into Fall. There are a wealth of butterflies that regularly visit the blooming Narrowleaf Goldenbush including the Mournful Duskywing, Gray Hairstreak, and Painted Lady. Flowers and foliage of Ericameria linearifolia - Narrowleaf Goldenbush. High resolution photos are part of our garden image collection.